Set aside, if you can, Mommie Dearest and all the ensuing parodies, all the drag queens and drama queens, all the dishy behind-the-scenes dirty laundry that's been aired over the decades about Joan Crawford, and consider only her performance in this movie�she was a first-tier film star for decades, a career that began in silent pictures and extended beyond the death of the studio system, and Mildred Pierce may have been her finest hour. Part of that, certainly, is because she's working in excellent company�the film is based on a novel by James M. Cain, whose pulpy works provided the source material for other terrific movies like Double Indemnity and The Postman Always Rings Twice, and was directed by Michael Curtiz, perhaps the most skilled Hollywood craftsman to fly under the auteur radar. It all adds up to a neurotic piece of film noir that borrows heavily from the tradition of women's pictures; it's the battiest portrayal of motherhood on screen you're likely ever to see, part Stella Dallas, part Psycho. The movie quite literally begins with a bang: Monte Beragon (Zachary Scott) crumples dead to the floor of his beach house, with just one word after the shots ring out: "Mildred." The search for Beragon's murderer is the framing device through which the story is told, in large, swooping flashbacks, and stylistically Curtiz and his production team (especially composer Max Steiner) do stellar work�what starts as all moody shadows and lighting and snappy dialogue transforms, when we move to the past, into a syrupy domestic drama in which all is not bliss. Crawford of course plays the title character, married to the chronically unemployed Bert (Bruce Bennett); the bills pile up in their middle-class Glendale home, and Mildred bakes pies and cakes to sell to the neighbors for pin money. Not for herself, mind you, but for her daughters, for whom Mildred is determined to build a better life, to sacrifice everything and everyone, if she must. Actually, make that daughter: though of course Mildred has an affection for her younger child, Kay, it's Veda around whom the universe revolves, according to her mother. The story pushes Mildred along to the revelation about Veda that we know from the jump: she's horrid, a monster, a pretentious social climber whose self-loathing comes out only as bile toward her mother. You want to cheer when Mildred says to Veda: "I think I'm seeing you for the first time in my life, and you're cheap and horrible"�unfortunately for Mildred, this epiphany soon gets clouded over, and she's back to a life of service. That involves divorcing Bert, and opening a surprisingly successful restaurant chain (called of course Mildred's); picking up a second husband along the way�Monte has the right bloodlines, and while Veda approves of his pedigree, his bank account has been cleaned out long ago; and fending off the advances of the scuzzy but useful Wally, a lawyer who looks after Mildred's business interests as she consistently rebuffs his advances. Crawford's strident yearning for a better life for Veda, and for her daughter's approval, verges on the psychotic, but the actress always sells it; in many ways, it's a strange actress playing a strange character in a strange story, but it's all treated as absolutely normal, allowing us to creepily draw our own conclusions. It's a movie that's keenly conscious about social class, something that Hollywood doesn't always handle very well; Curtiz also displays a sharp eye for architecture, and there are sequences here that could serve as promotional videos for Southern California real estate. But the psychology is what stays with you: there's a sense that, for all their knocking heads, Veda and Mildred are doppelgangers, cut from the same bolt of cloth. They have the same hair color and style, and Veda gets to do all the things that Mildred dreams of; when you profess to be Ma Joad but you've got the temper of Mama Rose, there are sure to be fireworks. Crawford is certainly the best one here, but Ann Blyth makes for a deliciously monstrous Veda. Also worth mentioning are Eve Arden, as Mildred's business manager, in an early performance in her trademark wisecracking style; and Butterfly McQueen as the Pierces' housemaid, whose unmistakable voice and manner are always welcome, even if she never got to play anything other than servants, it seems. Image Transfer Review: The images fairly sparkle here�it's clear that care was taken in the restoration, and it looks absolutely terrific. Don't let the crimson DVD cover art fool you: as all the best film noirs are, this one was made in glorious black and white. Audio Transfer Review: The mono elements have their limits, but, like the picture, the sound was restored and transferred with delicacy and care. 8 Other Trailer(s) featuring Humoresque, Possessed, Flamingo Road, The Damned Don't Cry, Goodbye, My Fancy, This Woman Is Dangerous, The Women, Whatever Happened to Baby Jane? 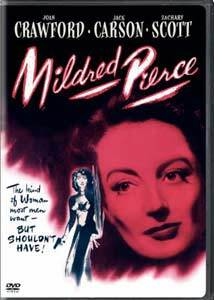 A strange and fascinating movie, with very high technical values on this DVD showing off Joan Crawford's finest hour. Leave the wire hangers in the closet, and enjoy this Michael Curtiz picture for its own merits, which are many.